Picture Don Draper’s New York. That’s how it was the first time I went in 1955. Awe-inspiring. That’s the term I would use. For a little 6 year old girl, living in Pennsylvania, it was magic! watching the skyline appear as we approached the city. There was so much awe and excitement about making those special trips. My grandfather was my tour guide. He owned a Textile Mill in Pennsylvania ,but did a lot of business in the city. He had an office in the Empire State Building on the 80th or 88th floor. which also became my New York. Experiences were valued, above all else. all the great philosophers & classic writers. He didn’t want to just buy me things. He wanted me to see things and learn . He loved spending time with me as I did with him. These were our special trips- every month- just the two of us. 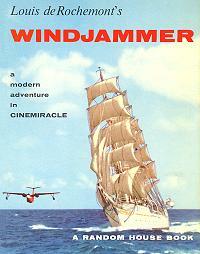 I remember going to a movie called ” Windjammer”, around 42nd St in some big theater. There was new technology called “cinemiracle”- which simulated a large Windjammer cutting through the rough sea.. It was so realistic- I actually got sea sick. He felt really badly about that! I was fascinated by the silliest things. 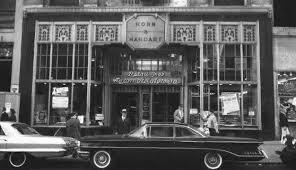 One of my favorite places was a Horn & Hardart Cafeteria. Where else could you put coins in a slot and have a piece of pie magically appear. Of course, I was only 8! Window shopping on Fifth Avenue at Christmas. every season, we would go to a Yankees game, if I agreed to go to a Phillies game too. He taught me so much, and showed me such wonderful things. And then he always asked me the same question…. He died very suddenly at 65 years old. I was 10 and it shattered me in ways no one ever understood. To this day- he is the person I miss the most . That wonderful, exciting part of my life with him was over. I went on to create my own relationship with New York in my teens. This New York included my parents and it was fun. Everything seemed possible in New York in the 50’s and 60’s. I felt different just being in the city. I remember eating at Danny’s Hideaway with my Mom & Dad. Danny Stradella, the owner,was my Dad’s friend. Apparently, it was a very “hot spot” for Celebrities- which I knew nothing about. One night, Danny brought a gentlemen over to our table and introduced him to my Dad and Mom. There was a short conversation: polite chit- chat. My Dad responded : ” Me too”. I didn’t even really know who he was and didn’t care much. But my mother was all atwitter. Frank Sinatra thought she was a “babe”! I’ve had a long and very satisfying love affair with New York. From going there so many years, I know the city like the back of my hand. Except for Soho. I always get confused in Soho! Greenwich Village was where civilization ended! the New York of my childhood is long gone. is the magic I feel every time I’m there. Now, I seem to wander down memory lane quite a bit. It’s comforting, quiet and golden- hued. and I can travel there any time I want. While researching Danny’s Hideaway, I came across your post, “Greetings from New York”. As a child of the ’60s, your NYC memories resonated very deeply, as I share many of the same magical memories about that era of NYC…to this day, I still love watching old movies set in NYC from that era. Incidentally, my dear grandfather worked for Danny Stradella as a waiter at Danny’s Hideaway in the early-to-mid-1950s. After my grandfather retired, he always had lots of stories to share about the famous celebrity customers, like comedian Sid Caesar and his writing staff who would eat there after their weekly show, Sid, once so exhausted, he fell asleep, his face landing in his dinner plate; having to, yet again, pour Mickey Mantle into a taxi after another night of too much celebrating; a young Merv Griffin begging for a free meal (before his song “I’ve Got a Lovely Bunch of Cocoanuts” became his breakout hit, launching him onto his talk show success). 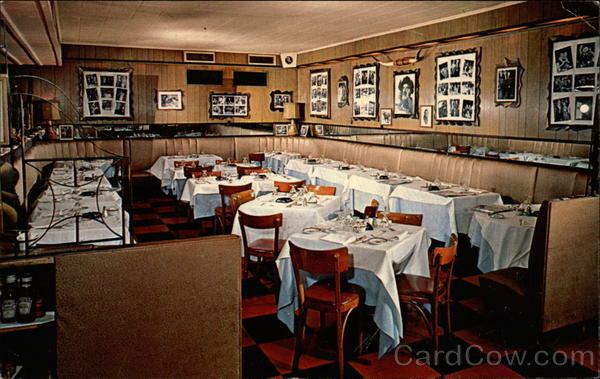 Actor, Gabby Hayes, who was also good friends with Danny, had a room in the restaurant named after him and it housed a lot of his memorabilia – I believe the photo above, possibly from one of the restaurant’s postcards, shows that room. My grandfather was especially fond of Mr. Hayes, a true genteman. What a wonderful grandfather you had and what a wonderful lesson: “Life is a great adventure”. Thanks so much for the comments on my “Greetings from New York” blog post. I loved New York in those days. It was so magical! 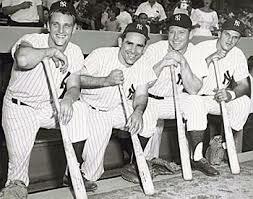 Happy to know of someone else who shares a passion for that era and had so many wonderful experiences as well. Thanks for sharing your memories with me! I had a little time to delve back into your blog posts, so beautifully written, because they’re from the heart…I think it’s safe to say that you and I are just a couple of old souls and probably always were. Jan, are you familiar with an artist/cookbook author named Susan Branch? I really think you would like her blog (just Google her name to find it). Likewise, I think you might really enjoy the whimsical work of Canadian painter Janet Hill (again, just Google her name for her website). Jan, you mentioned in one of your blog entries that you would like to spend time in Paris (for me, I’ve always longed to see London, so that’s what I am slooowly saving up for). Have you seen the film “Paris Can Wait” starring Diane Lane? If not, you should look for a dvd copy, maybe at your local library – tout de suite! A very good film with a message I think you might enjoy hearing right now – your life is just beginning a new chapter, the best is still to come. This “tiny life” may be short, but it is wide, my dear. Thank you so much for your comments. I have been to Paris many times but I would love to live there for a few months. I think you will love London. No language barrier and yet quite different from the States. Thanks for your recommendations on blogs and movies. Will check them out.